HARDWOOD FLOOR REFINISHING PROJECT: HOW LONG DOES IT TAKE? It is always best to plan ahead for a hardwood flooring project as you may have to be out of the house (and probably should be!) while the job is underway! Besides the overall size of the job, another important factor is the type of polyurethane that you pick. Oil based polyurethane takes twice as long to dry as a water based poly, and only one coat can be applied per day. If you are going with a stain on the hardwood flooring, this adds at least one additional day to the project as well. Rubio Monocoat and WOCA hard-wax oil finishes don’t involve any polyurethane, but both products have their own timelines, which I will cover! In general, we can sand about 1,500 – 2,000 sq ft in one day. Newly installed, unfinished hardwood is easier to sand, while a re-sand of treated and/or older hardwood flooring is a slower sanding process. Our team models some of the newest and best hardwood flooring equipment in the industry. We have been doing this for years, and we are extremely efficient workers! If you have used Murphy’s Oil or other similar products on your hardwood floors, this makes for much slower sanding, as it gums up the sandpaper and is very difficult in general to sand out of the wood. Polyurethanes applied a long time in the past can also be difficult to remove or sand completely out of the flooring and thus, these projects take more time. Any repair work/patching or removing of carpet, staples, etc., adds additional time to a hardwood flooring project. Flooring that has suffered moisture damage and is cupped or rippled will need additional sanding time as the wood floor will have to be sanded at a 45 degree angle to flatten it before proceeding with normal sanding that follows the grain of the wood. Humidity also plays a huge role in a refinishing timeline. Humid conditions slow drying times of everything: stain, polyurethane (both oil and water), and Rubio/WOCA products! Humidity can be mitigated, however, with a climate-controlled interior! For a natural (no stain) sanding job with 2 coats of an oil based polyurethane finish, the minimum amount of time needed to complete a job of any size is 2 days, and for 3 coats of oil based poly a minimum of 3 days. We recommend at least 2 coats of oil based polyurethane + a lacquer sealer coat as a minimum for hardwood flooring. Extra coats = extra protection, but only one coat of oil based polyurethane may be applied per day, as it needs 24 hours to dry before applying another coat. For example, a job of 100 sq ft – 2,000 sq ft finished natural with 1 coat of lacquer sealer and 2 coats of polyurethane would take 2 days to complete (without any of the above mentioned time-delaying factors). The first day would be sanding the floor to bare wood, applying one coat of sealer and then applying the first coat of oil based poly. The sealer dries quickly and the first coat of poly is applied right after it is dry. The final, or second coat would be applied on the second day, after the first coat poly has had sufficient time to dry. If the customer has elected to get 3 coats of oil poly, one additional day would be added to this timeline. For natural (no stain) jobs over 2,000 sq ft and under 5,000 sq ft, it would take us 2-3 days to get the floor sanded, sealed and one coat of oil based poly applied. Add one additional day for each additional coat of oil based polyurethane. RECOMMENDATIONS AND DRYING TIMES FOR OIL BASED POLY: For a refinishing job with oil based poly, we recommend that customers and their pets be out of the house completely, as the fumes are noxious and are not safe to inhale while the product is drying. 24 hours after application, an oil based poly can be walked on with socks only, though the smell will still be very strong and not safe to inhale for extended periods of time. We recommend removing shoes to walk on a hardwood floor newly treated with an oil based poly for at least 3 days after the final coat is applied. Oil based poly takes a bit longer to fully cure and harden, and thus our recommendation is to wait a minimum of 5 days before putting any furniture on the floor. A week is most ideal! Do not allow pets (especially dogs) onto a floor newly treated with an oil based poly for at least one week after completion. For a natural (no stain) sanding job with 3 coats of a water based polyurethane, we can complete a job of 100 - 1,500 sq ft in one day. We recommend a minimum of 3 coats of water based polyurethane as it coats in thinner, but harder layers, than an oil based poly. Water based polyurethane dries very quickly and up to 4 coats can be applied in one day. Jobs 1,500 – 5,000 sq ft, 2-4 days for completion. RECOMMENDATIONS AND DRYING TIMES FOR WATER BASED POLY: For a refinishing job with water based poly, it is possible to remain in the home while the project is underway if bedrooms are not being done. Water based poly can be walked on with socks only 3-5 hours after coats are applied. We recommend removing shoes to walk on a floor treated with a water based poly for at least 3 days after the final coat is applied. Water based poly dries and cures faster than oil based poly, but we recommend waiting a minimum of 3 days before putting any furniture on the floor. 5 days is more ideal! As with oil based poly, do not allow pets (especially dogs) onto a floor newly treated with a water based poly for at least one week after completion. There is one water based product on the market that fully dries and cures in 24 hours…e.g., safe for furniture, normal traffic, etc. If a client is in a rush to have a project completed, we recommend and use Bona Traffic HD (High Durability), which is the top of the line water based polyurethane: it is extremely durable, a beautiful and contemporary finish, and is ready for normal traffic in a quick 24 hours. It is pricey, but worth it for many reasons! 24 hours after a stain has been completed, 3 coats of water based poly could be applied in one day, and 1 coat per day for oil based polyurethane. WOCA and Rubio Monocoat are both all-natural, hard-wax oils that do not require polyurethane – they are hardening oils that provide both color and protection that is part of the wood floor, as opposed to layers applied on top of hardwood. Both can be spot-repaired. Woca and Rubio products have their own guidelines. 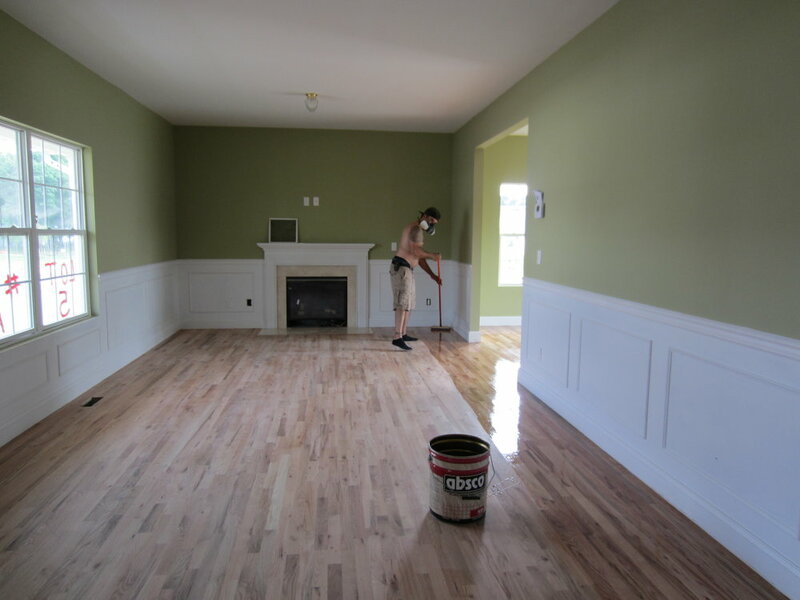 WOCA products must be applied to a floor sanded to 100 -120 grit, which requires an extra pass of the sander (or an additional “cut”), which adds a day of sanding to projects 1,500 sq ft or larger. We recommend 2 coats of WOCA, a base coat, and a top coat which creates a matte, silky appearance. For WOCA applications, projects up to 1,500 sq ft will take 2-3 days, and add one extra day for every additional 1,000 sq ft.
Rubio requires an 80-grit sand, which is normal for all sanding procedures. Rubio necessitates only one coat, and wood treated with Rubio will not take more than one coat of the product. Rubio is, in our opinion, a “harder” product and does take longer to buff in than WOCA finishes. As a result, the timeline for Rubio products is about the same as WOCA, though it requires one less pass of the sander: projects up to 1,500 sq ft will take 2-3 days, and add one extra day for every additional 1,000 sq ft.
After treatment with Rubio Monocoat and WOCA products, floors can be walked on with socks only after 12 hours of drying time. WOCA is fully hardened and usable after 36-48 hours, though care should be observed during the first week after project completion. Be careful not to expose the hardwood floor to water during the hardening time. Rubio floors require 7 days to fully cure, become water resistant, and harden completely. Rubio floors are useable 36 hours after the oil application, though care should be observed. After 48 hours, on areas with very heavy traffic (such as movers bringing furniture in) the surface should be protected with cardboard, but only during the traffic period. When heavy traffic is over with, remove the cardboard. Once the cure period has passed, the oil will be resistant to most liquids. Rubio Monocoat and WOCA both make their own cleaners and maintenance products, and we always advise following the manufacturer's recommendations! Now, with a better idea of how long a hardwood floor refinishing project will take, we suggest you plan a vacation accordingly and let us go to work! 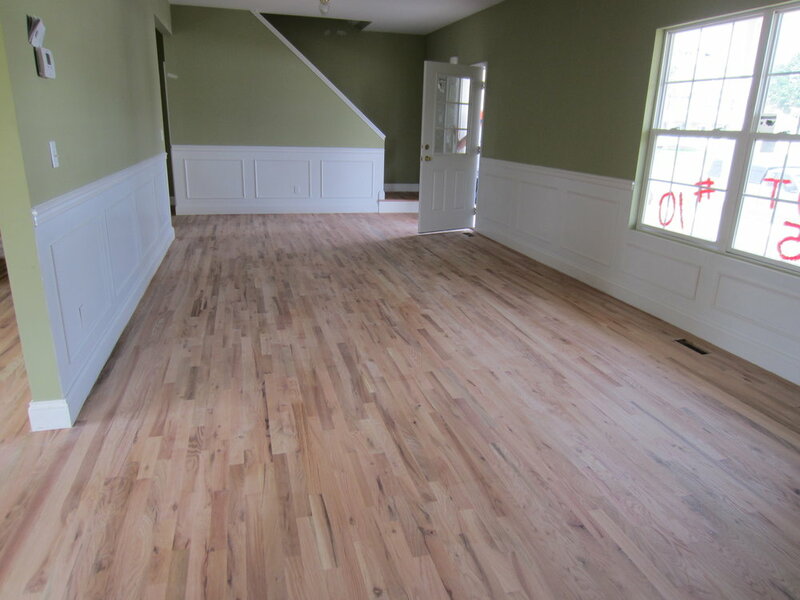 :) It really is much easier to be out of the house and out of the way, and then come home to a beautiful new hardwood floor... With that being said, we've worked with many clients who elected to stay in the home while the flooring project was underway, and we've made it work. Some houses make it more or less feasible to do this, and we are happy to advise as to what will produce the best results!